To be honest I have never considered a scooter above 125cc to have a place in the market. I am not sure if it’s a matter of pride over purpose, but let’s face it, with so many other “proper” motorcycles in a similar price range, why would a maxi-scooter have any appeal? Like myself, I am sure this preconceived prejudice is shared by many. Thankfully I had the opportunity to ride the range topping SYM MaxSym 600cc Super Scoot and boy was I in for a surprise! The SYM MaxSym might just be the most underrated motorcycle / scooter I have ever ridden! From a point of performance, practicality and user friendliness it must surely be near the top of the list in two wheel transportation. In Europe, maxi-scooters are big business and extremely popular. In most instances you will find that households do not own a second car, they have scooters! The bigger the better! In South Africa we haven’t quite grasped that concept. It’s time we did! The SYM brand has firmly established itself in the South African market place. Their core company value of quality without compromise has brought about much success in the entry level scooter market where sales are booming. Larger capacity scooters have not quite made the same impact, possibly because they do not quite enjoy the same perceived aspect of affordability. Sure they are pricey but after spending some time on the scoot, I can see so much more value in what it offers! My first impression is that this is an ultra-modern scoot with magnificent styling. I tried looking for “FLAWS” in the finishing but could not find any. The illuminated dash display is one of the most striking I have come across. The MaxSym strikes one as a well-balanced unit with a solid feel. A 565cc, liquid-cooled, 4 stroke, single cylinder engine with fuel injection is what keeps the wheels turning! 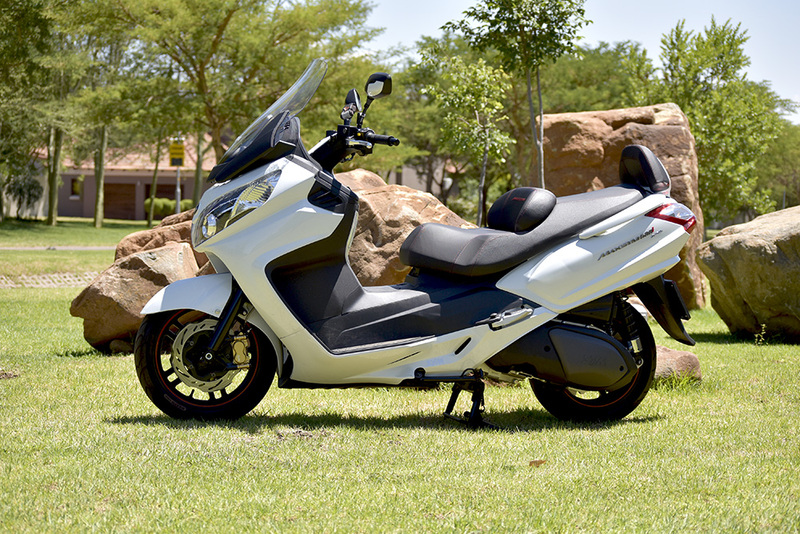 With 30Kw power and 43,2Nm Torque available on tap at reasonably low RPM, the SYM 600 Super Scoot cruises the highways and byways in absolute armchair comfort. The power delivery is smooth and somewhat unexpected with a speedometer needle that just keeps climbing! 180km/h top end! Assuming the gauge is not overly ambitious, that is a fair amount of go! Talk about a wolf in sheep’s clothing! Imagine the surprised look from a Valentino Rossi wannabe on his blinged out superbike when I sailed passed him on an open stretch of road. “Surely that’s not a scooter” sums up his body language at the time! That kind of power makes the riding experience superb. The scoot is in no way marketed as a speed demon but its ability to haul does encourage a relaxed riding style. Overtaking other vehicles or getting ahead of traffic after lane splitting is a breeze with no hesitation! It completely dismisses that “mobile chicane” feeling one might experience on a lessor sized scoot with a barrage of cars in tow. The twist and go throttle enabled by a fully automatic CVT transmission compliments ease of use and makes it possible for just about anyone to enter the wonderful world of motorcycling. Something to consider if you might be intimidated by the complexities of regular motorcycles and the way they operate. The brakes are good and the ABS inspires confidence, however I found it a bit strange only having brake levers on the handlebars. I would have liked to see the inclusion of a rear brake pedal on the floor board like those seen on other large capacity scoots. 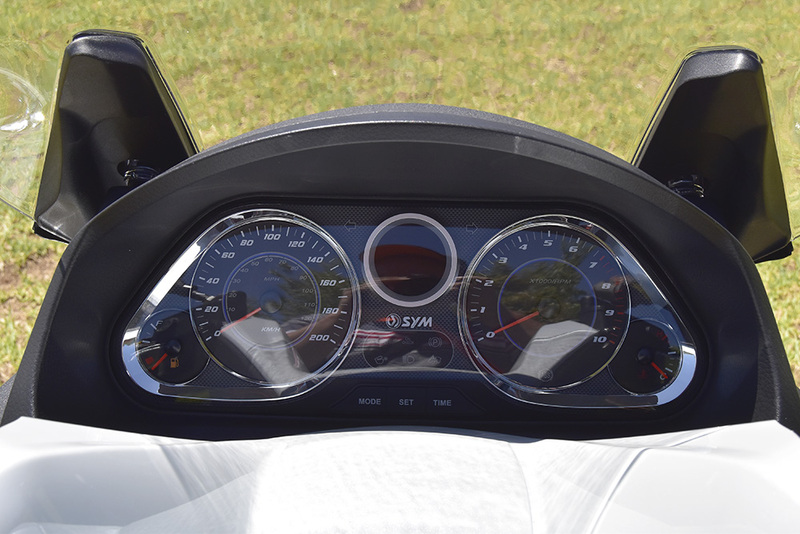 It felt like I was on a fast bicycle at times, a bit daunting when reducing excessive speed. I was really impressed with the handling and stability. Although the MaxSym should feel heavy at 234kg, it doesn’t really. 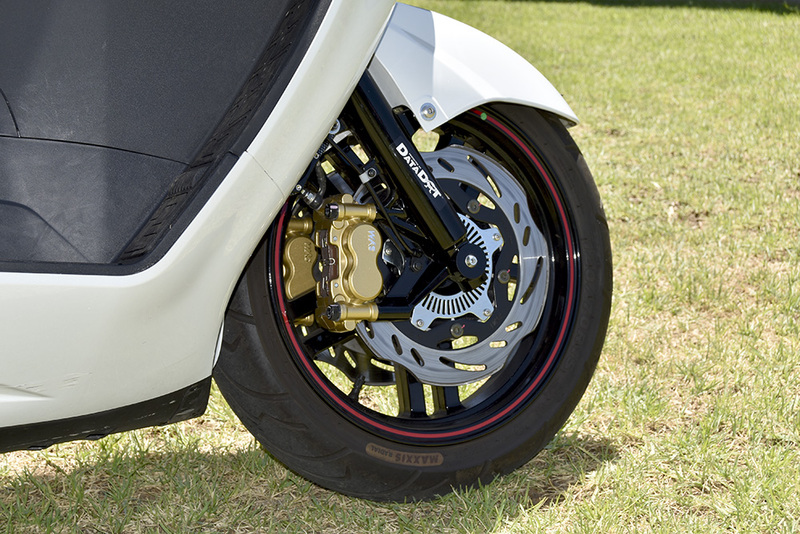 The designers did a good job of keeping the centre of gravity low and with that they were able to produce a scooter that is well planted and easy to handle. There was no sign of wallowing through sweeping corners and the scoot remained composed at all times. 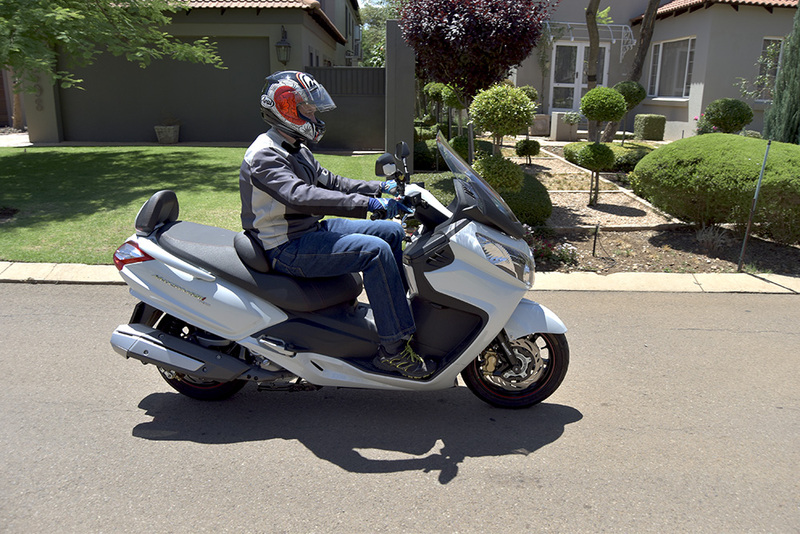 The long wheel base has little effect on the SYM’s agility, manoeuvring through traffic is effortless and although it appears fairly bulky, lane splitting is easily managed. What really tickled my fancy is how practical the MaxSym is. First of all the storage space is a massive plus with a compartment under the seat that is big enough to house two full face helmets or a decent amount of luggage. If that’s not enough there are also some handy cubbyholes that offer space for smaller items, one of which houses a 12V socket and a USB port, a great addition if you need to charge your phone while on the go. Ample wind protection and a very comfortable seating position with backrests for rider and pillion ensure that the road is never too long. Excellent fuel economy of around 25km/l will give you a range of between 300 and 350km at touring speeds. Would you have thought a scooter could make an incredible touring option for that weekend away? Surprisingly it does! I learnt an important lesson while riding the MaxSym. All bikes are created and designed to fulfil different needs, some might attract a niche market, and others may be more popular. One should be careful not to underestimate certain models due to preconceived misconceptions. I entered this review with very little expectations but was pleasantly surprised. Avoid being narrow minded when it comes to choosing your ride, you might just find joy with the most unexpected choice. Maxi-scooters do have a place on our roads, they are worthy of serious consideration if you in the market for a transport solution that will not only help with the household budget by reducing fuel costs but they also offer the added bonus of the ability to travel beyond the daily commute!